PhyscoHunt is the citizen science initiative of the Funariaceae Research Group. We want to open the opportunity to any nature enthusiast to find and contribute to our project with their own specimens. Here you will find everything you need to know. The goblet moss, or bladder moss (Physcomitrium pyriforme) is our model organism. If you want to contribute to our research: FIND, REPORT, and SEND samples. 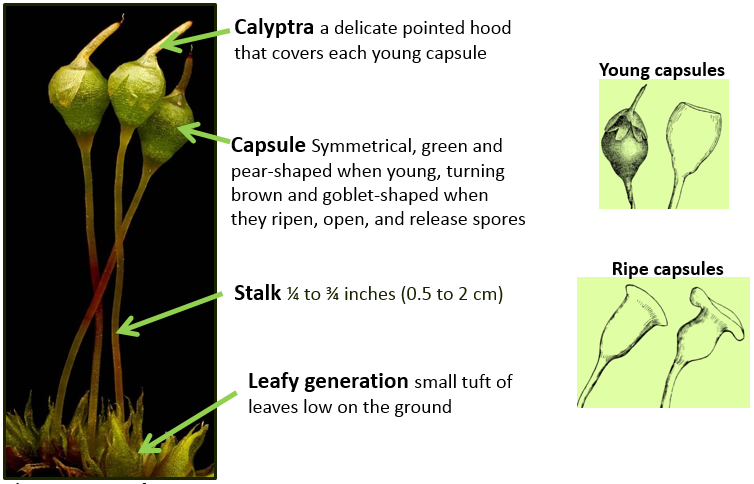 You will identify this moss by its pear or goblet-shaped capsules growing on top of the leafy generation. A hand lens will be helpful. Where? The goblet moss grows in a variety of habitats, often next to populated areas. Pay attention to disturbed moist soil in roadsides, gardens, lawns, floodplains, riverbanks, abandoned croplands, or pastures. We welcome your finds from anywhere in North America and Europe. When? This moss has a short life cycle and is only noticeable during part of the year, mostly during spring but sometimes also in the fall, so keep your eyes open for suitable habitats in both seasons. In order to report your findings, we need the location (with coordinates, if possible), date, and a picture to confirm the ID. When taking pictures consider appropriate light, focus and zoom. The preferred way to do this is through the iNaturalist app. If you are unfamiliar with iNaturalist, you will find all you need to get started here. It is very easy to use, and as soon as you ID your observations as “goblet moss”, “bladder moss”, or Physcomitrium they will be added to the PhyscoHunt project automatically. You can see all the observations through the PhyscoHunt project on iNat. Feel free to join and participate. Reports can also be done via email (see below). To take your contribution one step further you can send your samples for us to culture and include in our research project. Samples for culture should contain viable spores. Collect them at the right stage. We will send you a reward in return! 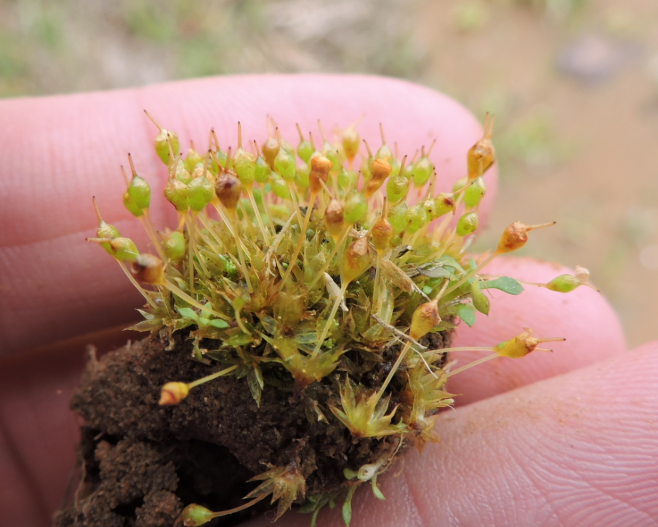 With more than 12,000 extant species, mosses are the most diverse plant group after flowering plants, and they are key components in many ecological processes. Despite their small size, they are approachable to all nature enthusiasts. Thank you for your help and happy hunting! For questions, feedback, or to report observations contact Rafa Medina (rafaelmedina@augustana.edu). Image credits: Mary Ade, Bernard Goffinet, Sam Kieschnick, James Lindsey, Rafael Medina, Caasi Saari, and Andrew Simon.